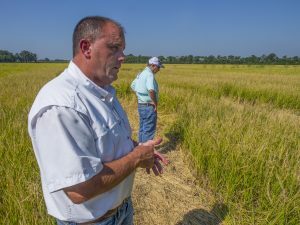 Today, the first ever carbon credits generated from rice farmers were sold to Microsoft, all because of a handful of pioneers who tested out a radical idea – that by implementing conservation methods on their crops, farmers could reduce methane emissions and thereby generate a carbon credit that could be later be sold on the carbon market. Not to mention the fact that these farmers also reduced water use by as much as 30 percent. Testing out the feasibility of the voluntary rice protocol revealed several hurdles for growers to participate – but it also provided a proof of concept that changes in farm management can indeed reduce emissions, create carbon credits and reduce water use by as much as 30 percent. Because of these farmers, we were able to learn what works and what doesn’t and spur the development of a grasslands protocol – and now, their leadership has led to an opportunity to generate credits at scale through a new nitrogen fertilizer management protocol. Here are insights from the farmers that made it happen. While the carbon credits program is important, the credits themselves are not our central concern. Three other concepts are involved. Number one, it’s the idea of potential – one thing leads to another. There are multiple opportunities involved, like saving water. Number two, the program fosters an ongoing relationship with researchers. That’s critical. And number three, it’s the right thing to do. If we can do the right thing but choose not to do it, well, that’s not a good thing, is it? 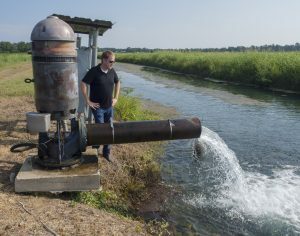 Mark Isbell pumping water on a rice field. Credit: Adam Jahiel. Economic incentives are growing. But you can’t always wait for the windfall; you have to do something because it shows potential. Now is the time to do this. Farmers are generally comfortable engaging a practice that has potential. They will look at it and take a risk; they don’t want to wait until it’s all figured out. There’s an element of choice in the carbon credit program, that’s important. It gives the rice farmer an option for income. Any program involving farmer participation has to have that flexibility. It never needs to be compulsory. Carbon credits are another step toward defining what it means to engage in sustainable agriculture. The Whitakers in a field of rice almost ready for harvest. Credit: Adam Jahiel. 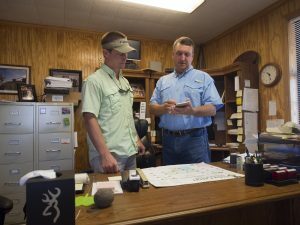 The Rice Carbon Offset project has been very rewarding for Whitaker Farms. Conservation has always been a major component in our family operations. This project has helped save millions of gallons of water, lower fertilizer rates, increase waterfowl habitat and lower GHG emissions. We consider this a win-win for the environment. Jim and Sam are part of a group who call themselves Nature’s Stewards. They’re setting the bar for what it means to be a sustainable production rice farmer. 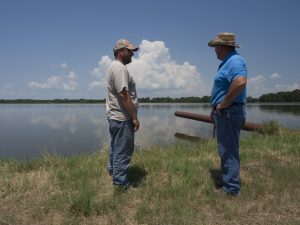 They’re after the conservation trifecta: water and soil conservation; expanding wildlife habitat; and, more recently, participating in the carbon credits market. We need more PhD’s in the field doing the research and finding out more about conservation methods; researchers tend to teach to the middle. That’s okay. I understand that. They’ve got their job to do. But we don’t aim for the middle. Mike Sullivan and his son Ryan. Credit: Adam Jahiel. The general public is screaming for sustainably sourced products. We’re building the base right now. We need a type of green seal on every bag of rice. That seal needs to to be accompanied by a barcode that, when accessed, tells the consumer that this rice came from a young farmer – which in my case would be my son Ryan – and was grown in Burdette, Arkansas using less water, less energy and at the same time creating more waterfowl habitat. Will the carbon credit deal help us get that green seal? I don’t know, but I’m willing to give it a try. I first heard about carbon credits when I was sitting on a panel. I kept asking myself: Why wouldn’t I want to do this? We’re already have precision-leveled fields and using AWD (alternative-wet-drying). Carbon credits program represents money on the table for us. I signed up. Dan Hooks and his son Luke. Credit: Adam Jahiel. With support from the Conservation Innovation Grants program at USDA’s Natural Resources Conservation Service, Climate Smart Group, Environmental Defense Fund (EDF), and K·Coe Isom are leading a nitrogen management pilot project that will determine the feasibility of developing carbon credits by improving fertilizer efficiency on croplands. Corn growers who are implementing or are starting to implement practices that optimize the application of nitrogen to their fields may qualify and could generate revenue from the resulting carbon credits. We are working to enhance the tools and technologies used to create offsets from rice cultivation to enhance their potential for the marketplace. There is a future for generating rice credits from agriculture – and for ag carbon markets on the whole – because these farmers proved that there is an interest and willingness to participate in pilot efforts that reduce emissions from agriculture. 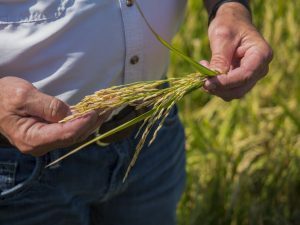 A diverse group of like-minded partners also guided these farmers through the process, including Terra Global Capital, American Carbon Registry, USDA Natural Resources Conservation Service, California Rice Commission, and the White River Irrigation District. This public private partnership was funded by NRCS under the Conservation Innovation Grants (CIG) program and Entergy Corporation. This entry was posted in Carbon Market, Climate Resilience, Sustainable Agriculture and tagged arkansas, california, carbon credits, CIG grant, conservation finance, conservation innovation grant, grasslands protocol, Microsoft, Natural Resources Conservation Service, nitrogen fertilizer management protocol, rice, rice protocol, united states department of agriculture, USDA, USDA NRCS. Bookmark the permalink. Both comments and trackbacks are currently closed.